Pioneer Lands is rated 4.2 out of 5 by 34. Rated 5 out of 5 by kaca66 from the perfect game Although I cannot get a gold on level 82, what ever I tried,I still can get 3 bonus games. This game is perfect. It has everything, a little mysterious quest to get one of the stars towards your gold, fun and beautiful farm to upgrade, stunning graphics and story set in wild west. Just simple one of the best games of this type.LOVE IT. Rated 5 out of 5 by BABETTY from Better than Royal Envoy Is the most amazing strategy game I have ever played..... Fantastic!!!!! Rated 5 out of 5 by SpookyPigdog from Lots of fun I've had this game for months, played it for months, and still haven't got all the golds. There are so many levels and I love the gameplay and having one worker who can only do certain things. And some of the levels are really challenging to get those golds! One of the few games where I love the music too! Rated 5 out of 5 by SimbaKomba from Loved it! This is such a fun little game. 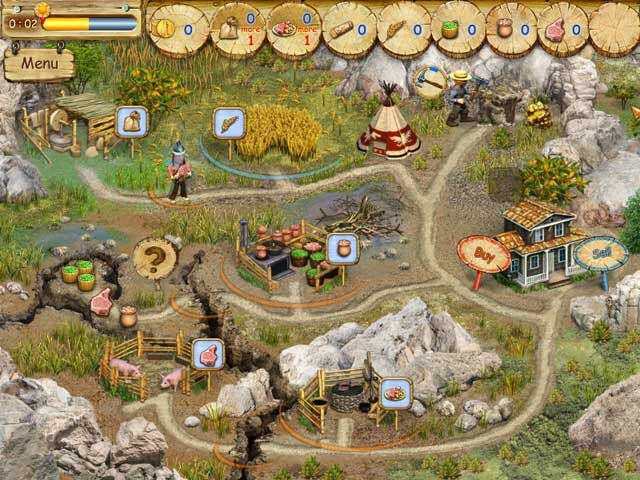 It is a strategy/time management game where you have to collect resources to sell or to produce other goods. It's sort of a combination of Farm Frenzy & Roads of Rome or My Kingdom for the Princess. It starts out quite easy but by half way through the demo it starts to get tough. One hint - read the chief's signposts - the bonuses can really help. Overall, I really enjoyed this game. Thanks to Big Fish for making it a daily deal - it's well worth it! Rated 5 out of 5 by coolguy1111 from AWESOME GAME AND GRAPHICS so dou want know what i think of the game I LOVED IT!!!!!!!!! it has wesome graphics and the levels are awesome!!!!!!!!!!!!!!!!!!!! Rated 5 out of 5 by xraycop from Love this Time Management game! This game has so many levels and challenges. I love the extra indian chief bonus! I usually finish a time management game in 2 days, making sure I get the gold level in all rounds. I've been working on this one for several weeks. Very fun and challenging. Rated 5 out of 5 by apiedmont from I love this game I first had this game for my iPhone, and it is completely awesome. It is a great example of this type of time management game. Totally worth trying and then buying! Rated 5 out of 5 by kiwicrone from great with extra awards and lovely graphics Really love this game. You can play through with or without reading the messages on the sign posts, but the awards for paying attention to them are worth it. On the way you get to build your own farm. Careful planning on some levels is really needed. 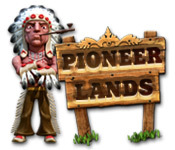 Rated 5 out of 5 by bettym from pioneer lands I love this game and play itt daily, do hope you are going to have pioneer lands 2 I'm wearing this game out. Rated 4 out of 5 by parigaza42 from more fun and more work agian. I recommend this game that kind of building that make you hurry to do and want to know about next resources to make process that you want to going to have. Rated 4 out of 5 by Kadra from Good Game This one drove me a little insane trying to complete challenges in the time frame. You have to persevere past the first levels which are so easy it fools you into thinking its easy. I admit i almost didn't buy it after the trial but it was a slow month for TM Games and I had a coupon that needed to be used. Part of the challenge is to time your characters actions including the returning to the house before the next item can be picked up. Had to stop playing for a bit or i would have thrown my computer out the window for that extra second to get gold. Great Game for strategy inclined not so great if you just want to run around and grab stuff. 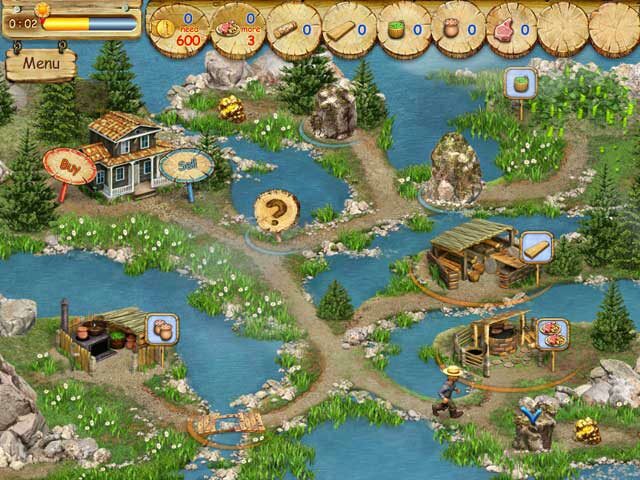 Rated 4 out of 5 by afigluiz from Hard game to 100% master I like both road building and time management games. I like this game because it does both of those, and does them well. (sometimes the games that are solely road building or time management gets repetitious and boring after some point) This game has a cute story line and cute characters. The game plays smoothly and goes quickly. I am one of those players that does not "just finish" but will strive to finish with gold every time. If I can't, I just keep replaying until it happens. This game is great for those that enjoy doing that. You can get "best time" but then there is that little sign that required to to go beyond "best time". This was the real challenge! 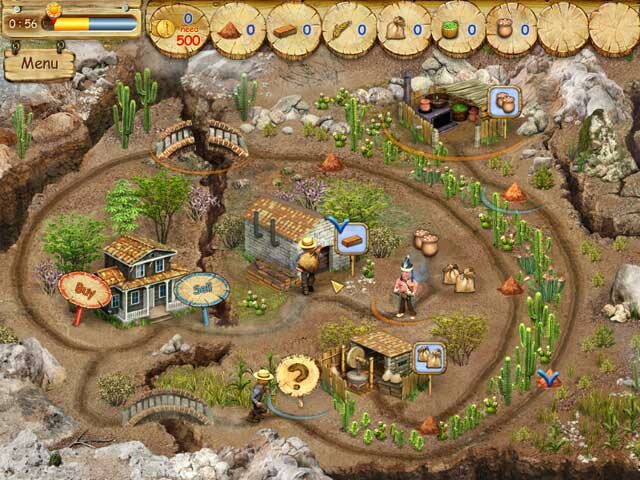 Rated 4 out of 5 by tucsonmac from pioneer lands It is a good game. not royal envoy but fun time challenges anyway. The one thing i do not like is that the person needs to return to the house to do the next task when it is not necessary. I am going to buy it and see if i can get the time challenges. Rated 4 out of 5 by tessa123123 from Harder than it looks It looks quite easy, but if you are to complete the challenges within the time limits and obey the requests from the chief, then it needs some tricky working out when to do what and who to hire or not hire. I am still trying to work out level 70 and I believe there are 99 levels in all. Rated 4 out of 5 by RainyDayzGrrl from Want a daily brainteaser? I have been checking this time of stategy game out for awhile, and of course I got caught up with the upgrades and trying to get an A+ on each level. I'm still not completely finished with the game, but I love that I can come and go. I have to admit there are still some levels that I've gotten stuck and unable to complete ALL of the challenges, so I went forward hoping that coming back would make it easier...it's quite challenging on some and wonder who gets stuck on which level and if it varies. If you're looking for a game you can come and go and play or even just play throughout a day that's long but makes you think really hard, and you like little perks such as additional ways to winning the challenges, this is an interesting one. I, also, like the little video scenes they're cute and funny. Rated 4 out of 5 by gulfangel from Love Challenging Games I love games that challenge your mind and keep you thinking. I usually go straight to time management games. This one is great to keep you thinking ! Rated 3 out of 5 by carmlita from Disappointed...would hve been fun I am handicapped, and can't move my hands fast enough to play this game. I was under the impression you could either play it timed or not timed. I can't get past level 11. :( Level of challenge is great. I rated it average, for the simple reason it is so repetitious watching the characters run back and forth, that perhaps it is good thing I can't go any further. Not fun for me at all. I research my games before I buy and I read that you could play it un timed. Of course the free trial never gives this information. In all fairness, the graphics are great. I love strategy games that make one think. It would be nice if you could hire more than two workers. If they make a sequel with options to turn off the timer, I'd go for it. for me it was a waste of my money. Could be a great game if given a choice to turn the timer off. I'd recommend it for anyone who isn't challenged. Rated 3 out of 5 by sweet_mamie_J from It really is just OK Glad we got a new TM game, but this one kind of blows. It just isn't a whole lot of fun. It does have two very redeeming qualities. There are alot of levels and the game play is challenging. Rated 2 out of 5 by wodiddilyhoo from Wouldn't recommend I have to say not being able to click ahead was a complete deal breaker for me. Watching the little guy walking back to the house after every action was really irritating. You also can't cancel actions so if you accidentally click on the wrong thing you have to wait it out. Rated 2 out of 5 by gracieann11 from Slow game play I did not like this game at all. The music was annoyingly twangy. You can't chain actions - for example, when you send out the worker to do something, you can't click ahead to have him do the next thing. You have to wait for him to return home and then you can click on the next action, wait to return home then click on the next....etc. This was a deal breaker for me. I didn't even finish the free hour. One last thing, there is only one skill level to play and by that I mean if you want more relaxing play or more challenging you can't set it to what you want. Rated 2 out of 5 by merrickpunk from Great Game but no challenge Good graphics, nice upgrades on the farm, but it is a little slow would have been nicer if the speed was faster, and the difficulty higher. Rated 1 out of 5 by skg122596 from how is this getting so many stars? It's times like this I wish I remembered to do a review right after I finish the free hour so when I go back to use a game credit, I don't waste it on a dud like this. This isn't just boring, it's PAINFULLY boring -- same thing over and over and over again with nothing to give you an edge, except the infrequent opportunity to hire a "male worker" (seriously???). I guess if you really like a challenge, this would be the game for you because I've found most levels to be ridiculously hard to beat if you also include the mystery instruction. Truly one of the worst games ever. Please, learn from my mistake. Rated 1 out of 5 by sarbec0574 from Needs work This could be a really nice game, but it is slow slow slow. You have to wait for your character to complete it's task, go all the way back to the house through the windy paths, only two workers are available and it is pretty much the same things over and over again.